I took a drive up the Columbia River this past Saturday to drop in on the Skamania County Bigfoot Bash and Bounty, held at Home Valley Park just east of Carson, WA. I was only there for a short while, but it seemed like a good old fashion family oriented festival, complete with a bigfoot jumper for the kids, a climbing wall for the vertically inclined, and booths selling various wares for those with a few extra bucks. There were guest speakers, too. Dr. Robert Pyle did a reading from his excellent book, and earlier in the day Henry Franzoni spoke of his new book, and Joe Beelart talked about his favorite research area, the Upper Clackamas River Basin. 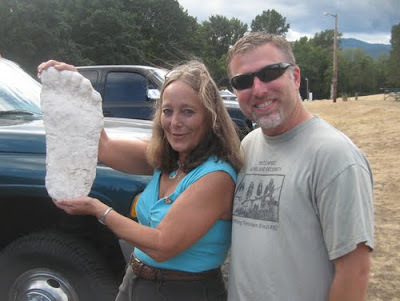 Patty Reinhold, former director of the International Bigfoot Society (originally headed by Ray Crowe) was on hand with her husband Bob. She was kind enough to bring a cast credited as being made by Scott White outside of Bend, OR for me to look at. It was an older copy, obviously reproduced in sand, but was impressive in its size and toe shape. It reminded me quite a bit of the Laird Meadow castshttp://cliffbarackman.com/bigfoot-prints/cast-index/1963-laird-meadow/ from 1963 (though it is published that these casts are from 1964). Now that I have a photograph of it and have had a chance to look more closely, I believe it is in fact the same cast, just mislabeled. (Mix ups like this do occur with no need for accusations of deliberate hoaxing by Mr. White or anyone else involved.) 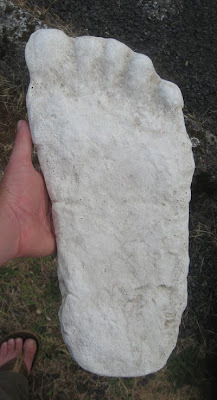 Feel free to compare the subtle markings on Patty's cast to the close uphttp://cliffbarackman.com/bigfoot-prints/cast-index/1963-laird-meadow/ found on my web page. Examine the toe positions, and more importantly the subtle markings found on the foot. Remember that much detail was lost when it was copied in sand, and think about how those markings would be more diffuse and less obvious after a generation or two of copying. I think you'll agree with my assessment. I hung out at the festival for a while visiting with friends, but I soon grew anxious to get into the woods. I took advantage of my location and drove up Wind River Road to the general area of Skookum Meadows for a night of bigfooting. As it turns out, Skookum Meadows has a bit of active logging going on, so I drove a few miles to the north. I eventually found a good campsite near a meadow just north of Squaw Butte. I set out my trail cameras, set up some thermal imagers to monitor camp all night, and hung out with my friend. At one point in the night, I heard a repeated call from the southeast, but the valley I was camped in had such active acoustics that the reverberation made the faint sound unidentifiable. I suspect it was an owl, but I cannot be sure. My recorder did not pick up the sounds. After turning in for the night, another repeated call was heard. I initially thought it was the wind howling through the trees, but I soon realized it was a vocalization of some animal coming from a great distance to the south. Upon reviewing that night's recording, the sound was not picked up by my microphone. Two strikes... I received no more metaphoric pitches that night. The next day brought mushroom hunters upon our camp. They were looking for king bolete mushrooms, which they sell for profit. One man I spoke to said he had never seen a bigfoot, but once he saw a "psychedelic bear" down on Diamond Mountain outside of Bend, OR. He said it was yellow, blue, and other colors. Weird. He agreed, and assured me he was stone sober when he saw it that morning. Saying that was the weirdest thing he has ever seen, he wished me luck on my weird quest and dug for fungi near my feet. 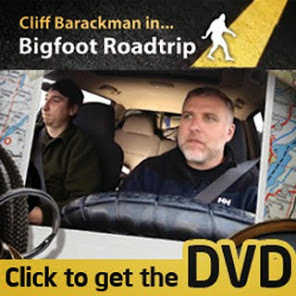 While no bigfoot data was gathered on this trip, I had a great time. I heard some weird unidentifiable noises in the woods, hung out with good folks, and spent time in beautiful country. 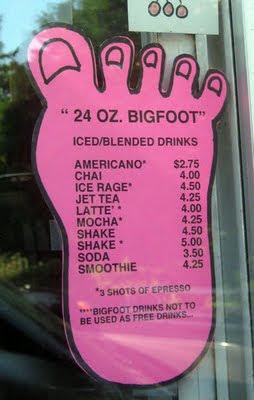 This is bigfooting, after all. You don't get them all of the time, so make sure you go for other reasons than the big hairy guys. On a side note, I thought I made a horrible blunder: forgetting to bring coffee on the trip. (For a teacher, there are few hardships worse than going without coffee!) Luckily I found a place in Stevenson, WA that serves my kind of java.